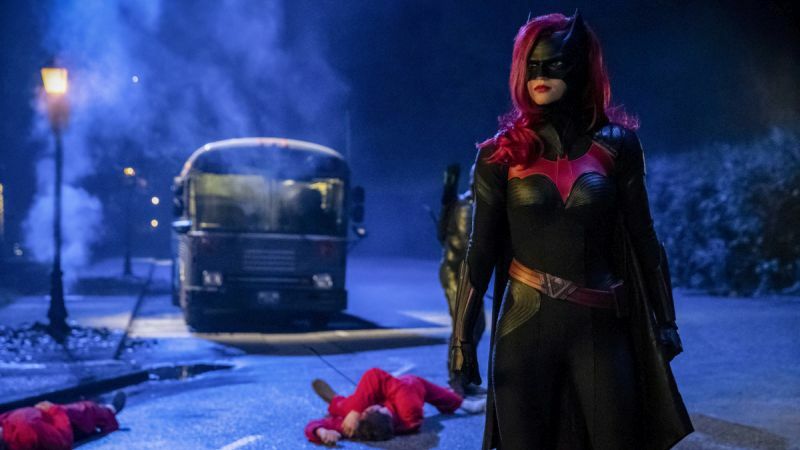 Arrow -- "Elseworlds, Part 2" -- Image Number: AR709d_0236b -- Pictured: Ruby Rose as Kate Kane/Batwoman -- Photo: Jack Rowand/The CW -- ÃÂ© 2018 The CW Network, LLC. All Rights Reserved. The CW has released a new trailer and a clip for Elseworlds part 2, the next piece of the three-part annual Arrowverse crossover. Both the clip and the promo feature our heroes venturing to Gotham City, where they see Ruby Rose’s Batwoman in action — who reminds them they were told to stay away by her alter ego, Kate Kane. You can check out both videos in the post below! This year’s Elseworlds crossover centers around Gotham City, a place that was previously off-limits to The CW. It stars Stephen Amell as Oliver Queen/Green Arrow, Melissa Benoist as Kara Danvers/Supergirl, Grant Gustin as Barry Allen/The Flash along with guest stars Ruby Rose as Kate Kane/Batwoman, Tyler Hoechlin as Clark Kent/Superman, Elizabeth Tulloch as Lois Lane, Jeremy Davies as Dr. John Deegan, Bob Frazer as Roger Hayden/Psycho Pirate and Cassandra Jean Amell as Nora Fries, the wife of the classic DC comics villain Mr. Freeze. This story will mark Rose’s debut as Kate Kane / Batwoman ahead of her own series, expected to premiere sometime in 2019. While Kate is Bruce Wayne’s cousin in the DC Universe, Batman isn’t expected to appear in this story or anywhere else in the Arrowverse any time soon. That said, Batman does exist in this world, and his absence will play a role in the Elseworlds story. And we may find out why Oliver Queen called him out by name last season on Arrow. Elseworlds continues tonight on Arrow, and will be available to watch the next day on The CW app.